There’s no question that the first priority of most golfers is hitting a drive down the fairway on the first hole. However, these same golfers also place a premium on the views along meandering waterways and lakes as they make their way through the round. While they may shake their heads in frustration as another ball lands in the drink, hackers and scratch golfers alike appreciate views of these scenic lakes and waterways. Without continual care, these lakes can fall into disrepair, resulting in unsightly shorelines and failing habitats for wildlife. Thankfully, most associations with golf courses and plentiful waterways understand the steps required to maintain these valuable waterways and their shorelines. In many markets throughout the country, golf course developers create lakes as retention ponds to prevent flooding. But, these artificially created bodies of water also increase the appeal of golf courses. As properties age, water can encroach on land, causing a variety of problems. With regular maintenance, lakes can fulfill their original purpose of minimizing the threat of flooding and, of course, swallowing up golf balls. Keep in mind that golf course superintendents continually—and for the most part, successfully—tamper with Mother Nature. Nevertheless, damage to shorelines is unavoidable. There is a natural progression resulting from storms and the encroachment of algae and other harmful plants that requires herbicides and mechanical control. Those charged with maintaining these properties must be proactive and take regular, affordable steps to avoid larger repair expenses. With an understanding of today’s technology and the environment, many of these problems can be reversed. While we can’t fool Mother Nature, we can subtly influence her. Water is one of the most corrosive agents and will eventually take its toll on scenic golf course shorelines. One important effort is to make sure there is water flow. This can be accomplished through the installation of fountain-like aeration systems (see below). Despite one’s best efforts, fluctuating water levels can destabilize the ground and result in significant erosion. This unstable land can be dangerous. For example, golfers walking on the shorelines can fall as the land collapses. Likewise, golf cart accidents can result due to weakened shorelines. Receding water levels also can become a haven for burrowing animals and further weaken shoreline properties. 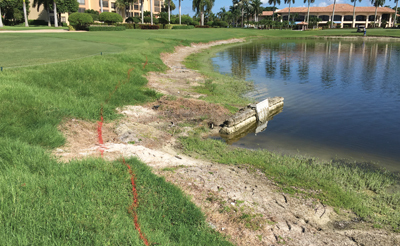 Poorly maintained shorelines can also leave drainage pipes, sprinkler systems, and electrical/ cable/internet lines exposed and subject to corrosion and damage. These repairs can be costly. Fortunately, there are several strategies to control shoreline erosion, including installation of sandbags, rocks, and trees. For the most part, these are band-aids. One permanent and eco-friendly erosion control technology is DredgesoxTM. It is an effective way to remove sediment from waterways and reclaim shorelines. The key advantage is that this innovative product allows one to utilize nature’s natural ability to stabilize the shoreline by planting and/or sodding directly through mesh armoring, establishing newly rooted vegetation. 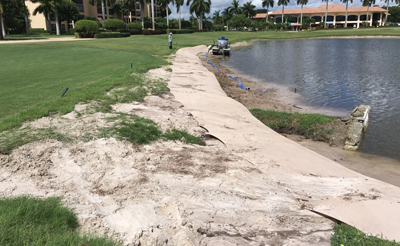 It is the most effective way to permanently halt erosion as well as follow best management practices. In layman’s terms, we are filling a huge sock with rich organic sediment and lining the shoreline with it. Once it is sodded and fully rooted, it becomes a permanent part of the shoreline and not susceptible to further erosion. Fountains Aren’t Just for Looks: Fountains are much more than ornamental features. They are an important part of creating a sound, healthy environment for fish to multiply and thrive since the fountains aerate lakes. In addition, fish are important as they can eliminate and control midge and mosquito populations. Part of maintaining a lake is stocking it with beneficial types of fish. This is no different than placing a snail in a fish tank to clean its surfaces. These efforts maintain a healthy ecological balance, resulting in healthy water, a safe environment for wildlife, appropriate vegetation, and elimination of damaging algae. Plantings for Aesthetics, Nutrients, Wildlife, Shoreline Preservation: It’s important to know that while some aquatic plants are beautiful, they may be harming the environment, polluting the water, and damaging the habitat for birds, fish, and other wildlife. It’s important to identify these harmful plantings, remove them, and replace them with aquatic plants that actually improve the environment. For example, appropriate plantings must provide nutrients for the water, thereby providing a healthy place for fish. They should attract wildlife seeking places for nesting and multiplying, and these plants must offer a food source. Plantings are also important in preventing erosion along the shorelines. By taking some of these steps, superintendents can preserve the value and beauty of their golf courses. Waterways are valuable golf course assets, which can enhance profitability, but like any other amenity, they must be maintained responsibly and efficiently. Presidents of Lake and Wetland Management, Inc.
Stuart Fischer and Brian Fischer are presidents of Lake and Wetland Management, Inc. (www.lakeandwetland.com). Founded in 1992, Lake and Wetland Management is a full-service environmental resource management company. Its state-certified, trained biologists provide environmental services for waterways, wetland management, lake management, and natural areas throughout Florida, leading the industry of environmental services. The firm works closely with many government agencies, builders, developers, property managers, and homeowners associations. Based in Boynton Beach, Florida, Lake and Wetland Management has 14 offices throughout the state.